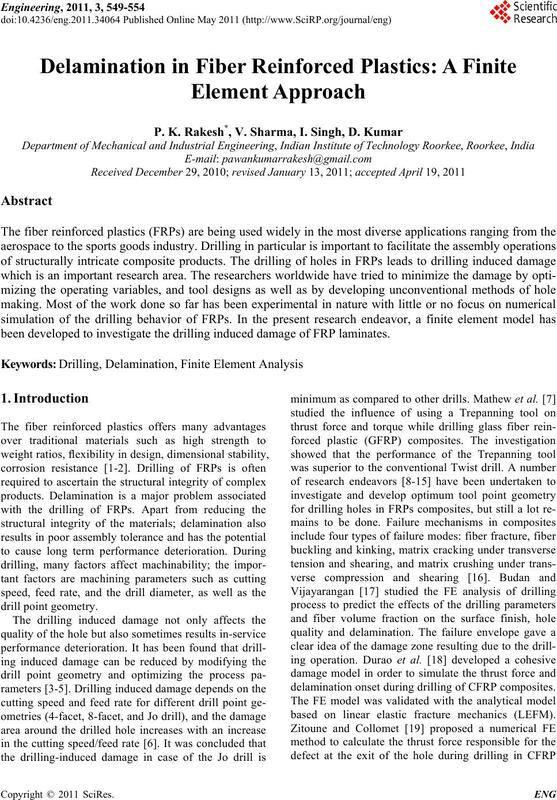 been developed to investigate the drilling induced damage of FRP laminates. 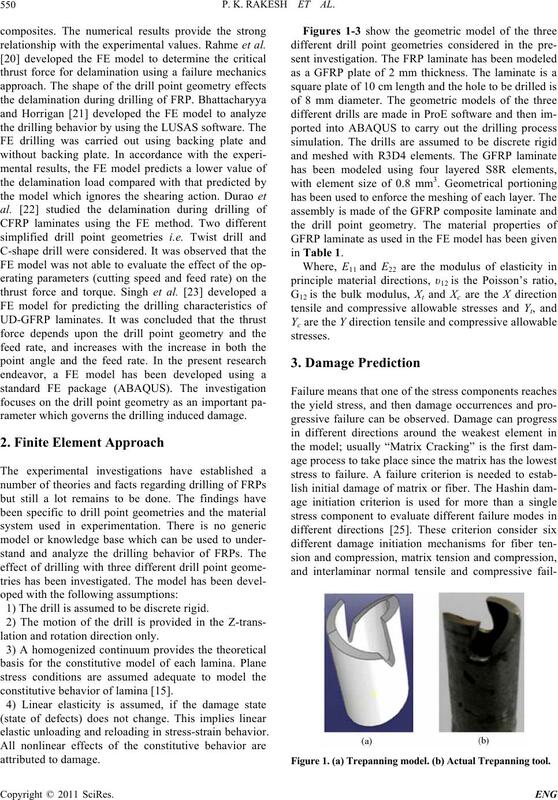 delamination onset during drilling of CFRP composites. based on linear elastic fracture mechanics (LEFM). P. K. RAKESH ET AL. relationship with the experimental values. Rahme et al. rameter which governs the drilling induced damage. 1) The drill is assumed to be discrete r igid. lation and rotation direction only. constitutive behavior of lamina . elastic unloading and reloading in stress-strain behavior. attr ibu ted to da mag e .
Figure 1. (a) Trepanning model. (b) Actual Trepanning tool. Figure 2. 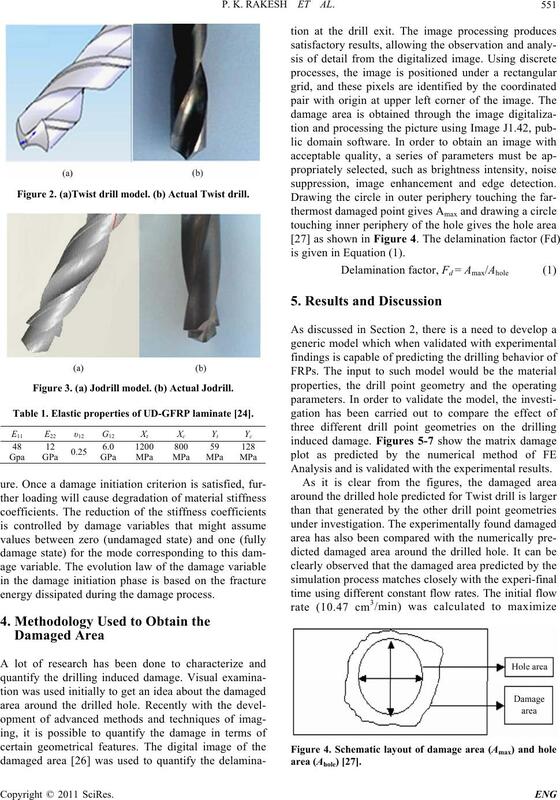 (a)Twist drill model. (b) Actual Twist drill. Figure 3. (a) Jodrill model. (b) Actual Jodrill. Table 1. Elastic properties of UD-GFRP laminate . energy dissipated during the damage process. suppression, image enhancement and edge detection. is given in Equation (1). Analysis and is validated with the experimental results. Figure 5. Matrix damage plot (Twist drill). (a) Matrix da- mage plot. (b) Experimental plot . mentally found damage area qualitatively. Figure 8. 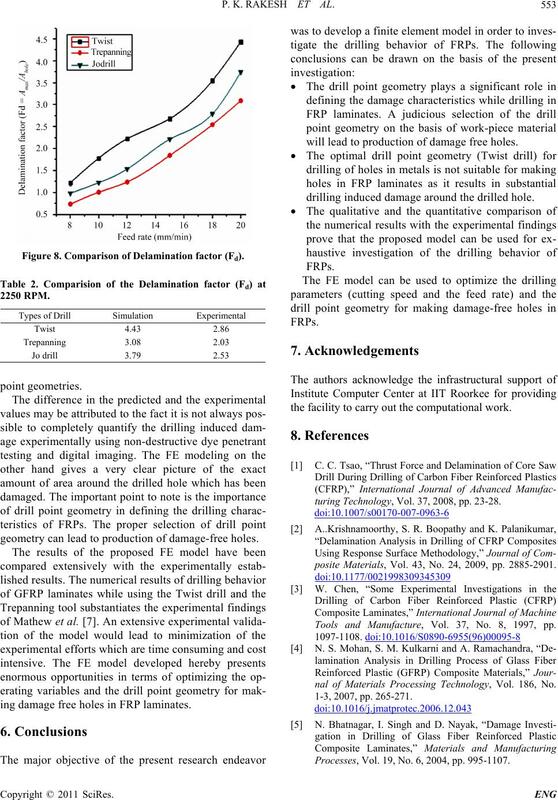 Comparison of Delamination factor (Fd). poin t g e o me tries. geometry can lead to production of damage-free holes. ing damage free holes in FRP laminates. will lead to production of damage free holes. drilling induced damage around the drilled hole. the facility to carry out the computational wo rk. turing Technology, Vol. 37, 2008, pp. 23-28.
posite Materials, Vol. 43, No. 24, 2009, pp. 2885-2901. Tools and Manufacture, Vol. 37, No. 8, 1997, pp. nal of Materials Processing Technology, Vol. 186, No. Processes, Vol. 19, No. 6, 2004, pp. 995-1107.
facturing Technology, Vol. 27, No. 9-10, 2006, pp. Vol. 30, No. 8, 1999, pp. 951-959. Journal of Composite Materials, Vol. 33, No. 9, 1999, pp. Vol. 31, No. 10, 2000, pp. 1107-1115. 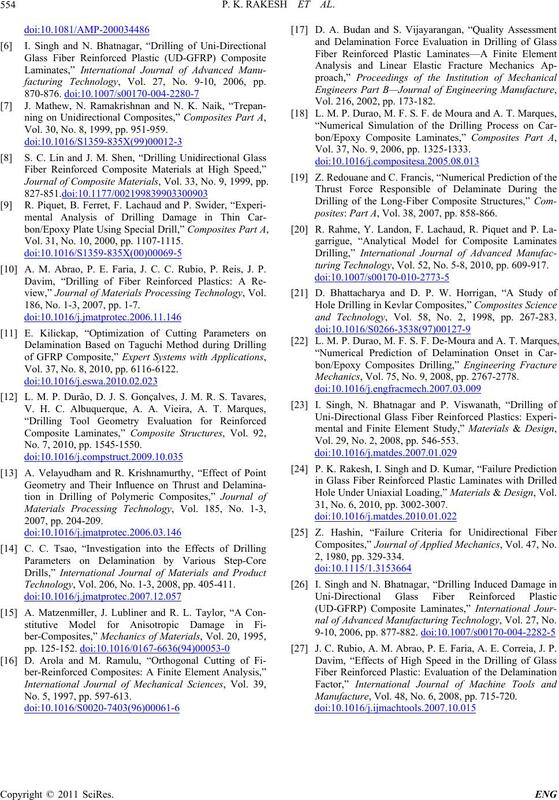 A. M. Abrao, P. E. Faria, J. C. C. Rubio, P. Reis, J. P.
view,” Journal of Materials Processing Technology, Vol. 186, No. 1-3, 2007, pp. 1-7. Vol. 37, No. 8, 2010, pp. 6116-6122. No. 7, 2010, pp. 1545-1550. Technology, Vol. 206, No. 1-3, 2008, pp. 405-411. No. 5, 1997, pp. 597-613. Vol. 216, 2002, pp. 173-182. Vol. 37, No. 9, 2006, pp. 1325-1333.
posites: Part A, Vol. 38, 2007, pp. 858-866.
turing Technology, Vol. 52, No. 5-8, 2010, pp. 609-917.
and Technology, Vol. 58, No. 2, 1998, pp. 267-283. Mechanics, Vol. 75, No. 9, 2008, pp. 2767-2778. Vol. 29, No. 2, 2008, pp. 546-553. 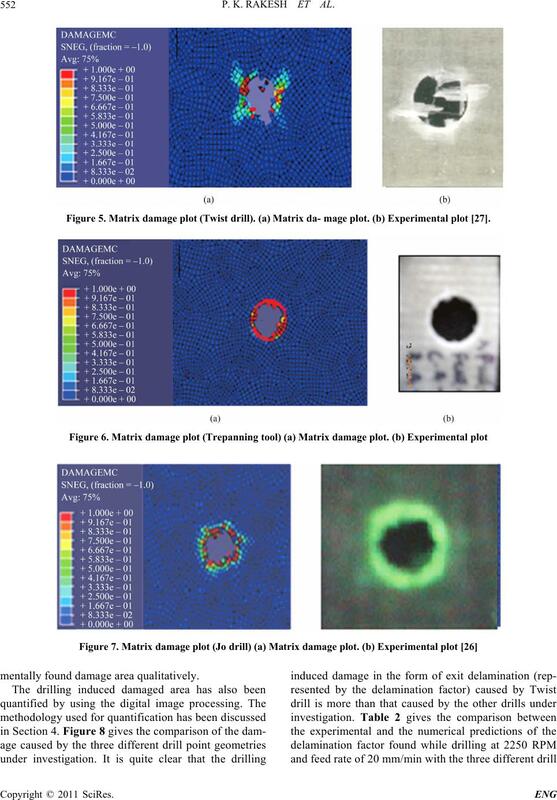 Hole Under Uniaxial Loading,” Materials & Design, Vol. 31, No. 6, 2010, pp. 3002-3007. Composites,” Journal of Applied Mechanics, Vol. 47, No. nal of Advanced Manufacturing Technology, Vol. 27, No. J. C. Rubio, A. M. Abrao, P. E. Faria, A. E. Correia, J. P.
Manufacture, Vol. 48, No. 6, 2008, pp. 715-720.